I love doing the end of the month wall of all that colour scrappyness. So much Turquoise got done and put in to quilt blocks. I love them all. I have so much turquoise and I have used it in many quilts lately so I have scraps to use up. The past 2 weeks, I got 5 blocks done for Talking Turkey and quilt pattern of Bonnie Hunter's that is in her String Fling book. I love that book so many good quilts to work on. I have started the pink and yellow blocks from the past months. These take lot of time so it is slow going. Pinwheels 16 got done. I am sure I will make a baby quilt using these or some of these. Poverty Piecing (also called crumb blocks). I used some of the tiniest triangles form some kind of cut off triangle unit. I got 16 6" blocks done. I have added this to Soscrappy's link. Not on the wall, but I got a group of 2 1/2" triangles done. I have many ideas with Triangles so I am sure they will find a home. So I did not really get all my pink done in May and put away. I had a stack of wacky pink pieces, so Poverty piecing had to get done. You have a gorgeous collection of teal and turquoise blocks! Thank you I use this colour lots and love it. Your turquoise wall is gorgeous! I really like all of the blocks you are making. Will you combine some into the same quilt or make individual quilts with each type of block? Either way, the quilts are going to be awesome. Most blocks will be a different quilt for each block. All pinwheels for a baby quilt. All Talking Turkey blocks for one quilt. I know I have lots on the go. Most of the seams are a good 1/4" so some of the poverty piecing blocks are heavy with so much seam allowance. What a wonderful wall of turquoise! 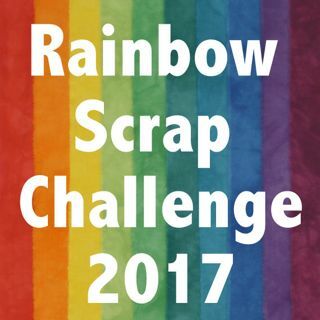 I'm glad I'm not the only one making several rainbow scrap challenge quilts. Love the name "poverty piecing"! Thanks, yes we are both a little crazy. Awesome looking design wall dressed in June's RSC Color of the Month!!! I suppose you are well on your way through your RED scraps by now. Have fun!! !